CURRENTLY OUT OF STOCK - Check back later. Violent Series trigger for the Bob Long Victory and new GR6 markers. This trigger is made of Delrin so it is super lightweight and very responsive. 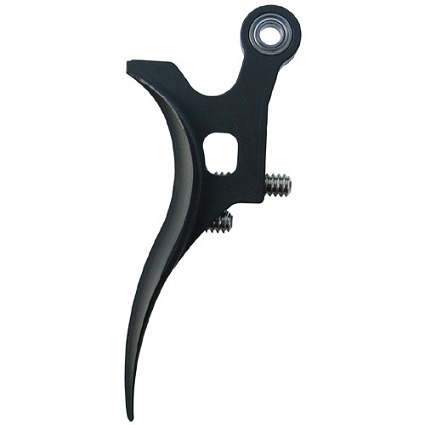 This trigger uses dual bearings and the stock pivot pin which eliminates all side-to-side play. The front face of the trigger has a nice radius that runs down the full length of the trigger. The radius on the front gives you a nice feel and contact point with your fingers, not a flat front and corner edge like other triggers on the market. The trigger is only available in Black because of the nature of the material. We have added a pre-travel adjustment which allows you more adjustability in the rake of your trigger.